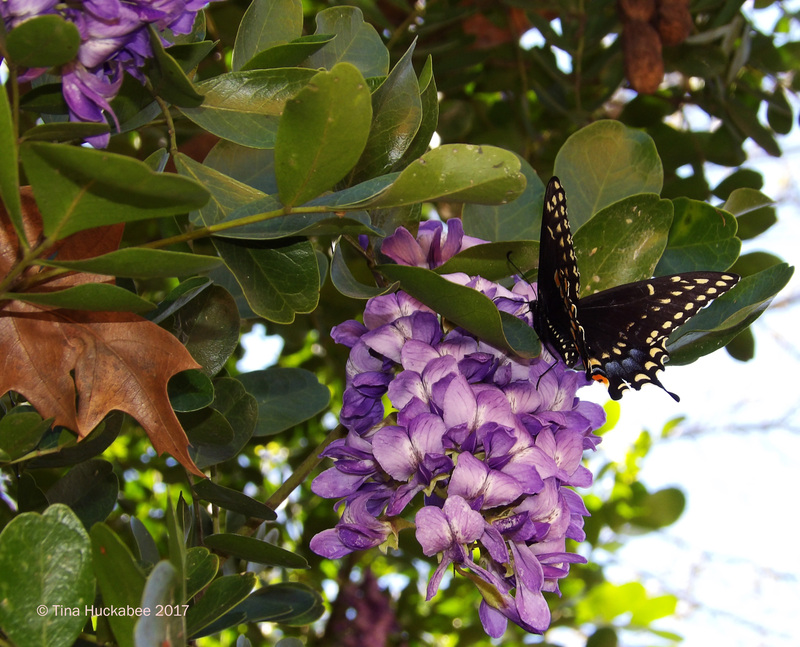 Ah, the smell of spring in the Texas air! 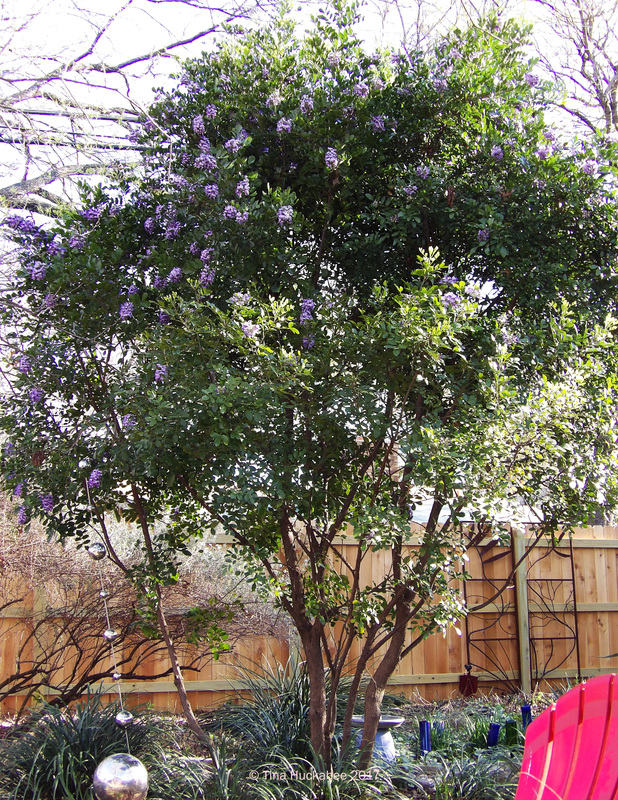 Northwest face of my Mountain laurel. The grape-soda-spring-in-the-air smell, that is. 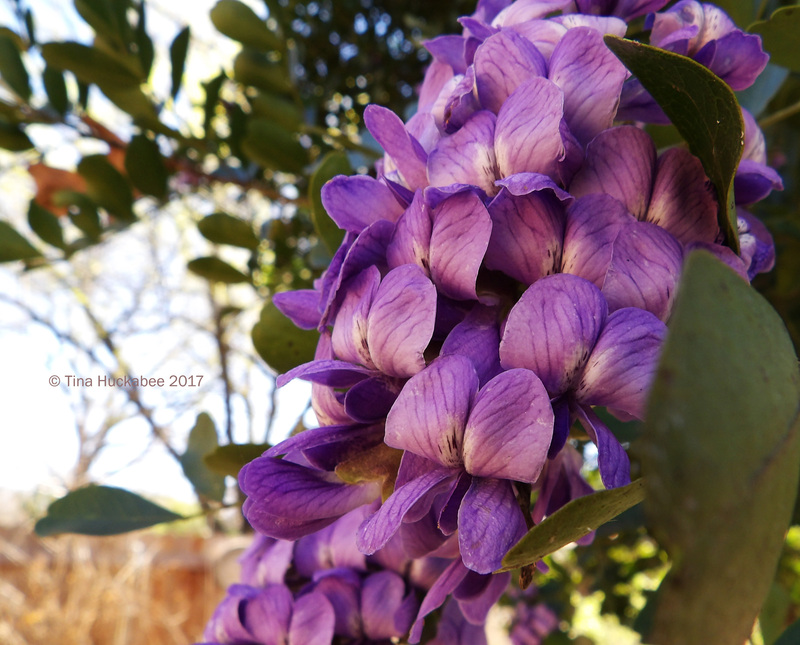 Texas mountain laurel, Sophora secundiflora, is at its peak of bloom in Austin and such a spring cliché, that I’m reluctant to add my photographic two-cents worth to the throngs of purple-powered photos appearing on FB, Nextdoor and elsewhere. Clearly, I’ve overcome my hesitation. Walking, riding my bike, and driving in the car, I frequently get a snoot-full of this heady, cloying fragrance, reminiscent of grape soda. 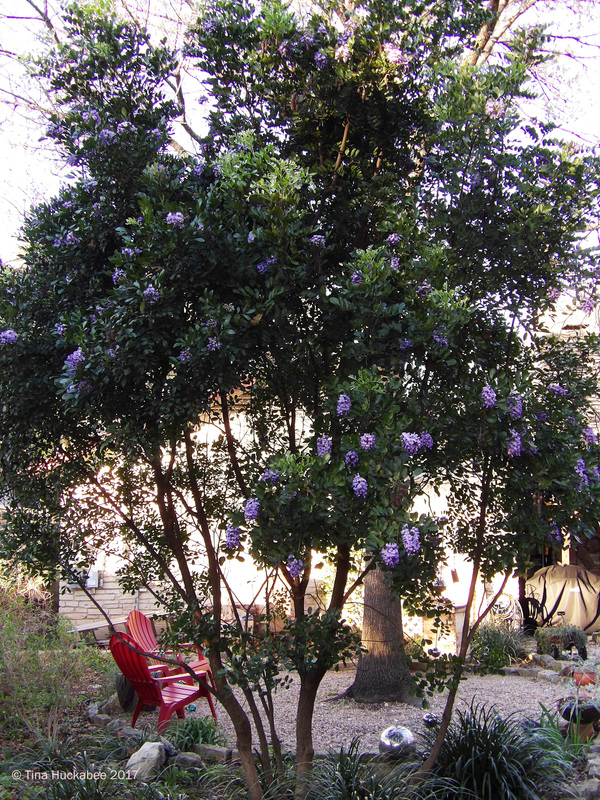 Texas mountain laurels are everywhere and why not? They are beautiful small trees year-round and stunningly beautiful trees during their short spring bloom period. The blooms are early this year, along with the awakening of so many other plants. Mild-to-warm winters and weird premature spring action has become the norm over the past couple of decades in Austin. 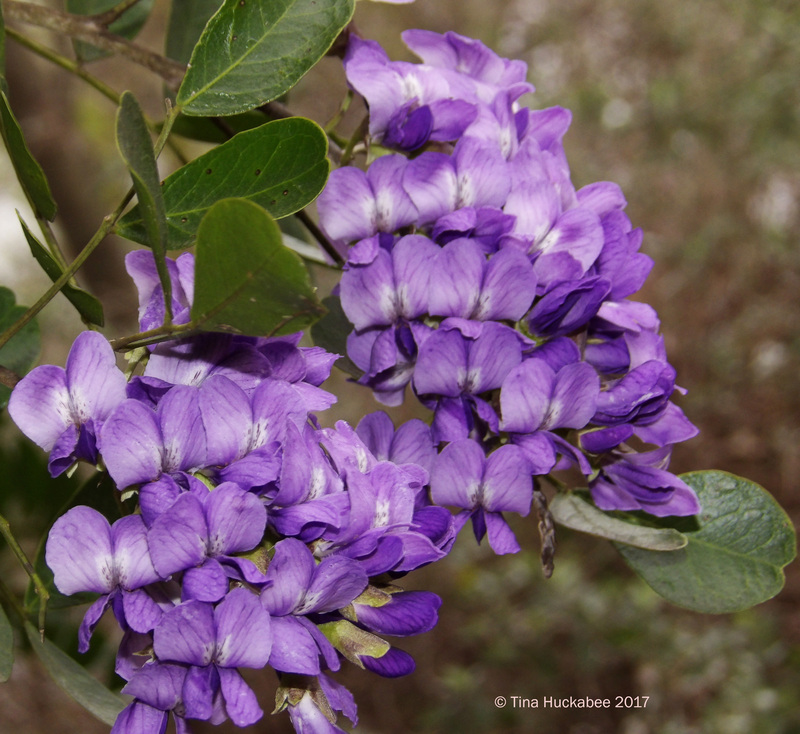 There was a time that mountain laurels bloomed consistently in March–sometimes earlier, sometimes later–but rarely in February. Times have changed and the climate has changed. I don’t mind an early spring, though that might mean an early summer and given the long, warm season in Texas, I don’t know many, myself included, eager for that particular scenario. But pollinators are pleased at the beginning of floral bounty and who can complain about that? Regardless, spring is here and there’s not too much we can do to slow the onslaught of new blooms-n-foliage. Breathe deeply and enjoy! 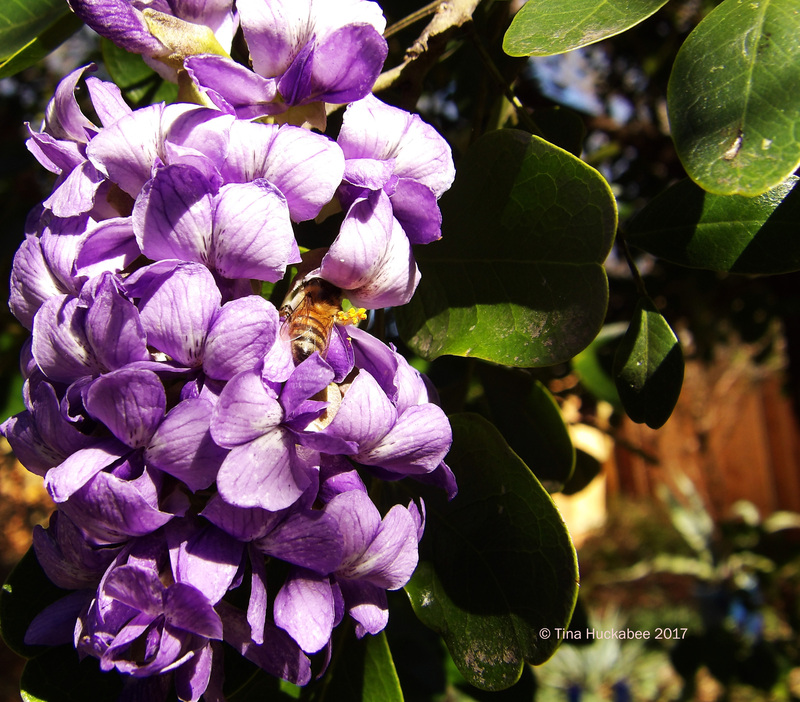 This entry was posted in Pollinator Plants, Sophora secundiflora, Texas mountain laurel, Texas spring flowers, Uncategorized by Tina. Bookmark the permalink. Ah – you’ve made me miss Texas! Oh–did you live here, or are you from Texas? My partner is from Texas, so we’ve been returning for family visits for twenty years! Ah, nice. 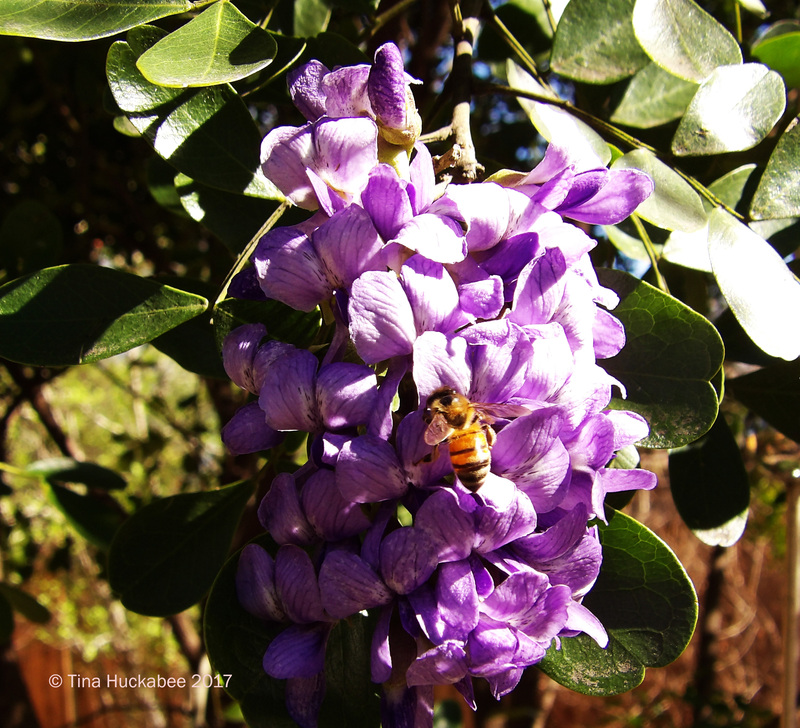 The spring wildflowers are starting up, bluebonnets have been spotted here in Austin and the Hill Country. We had just the right amount of rain in autumn and it’s supposed to be a good show! Woo-hoo! 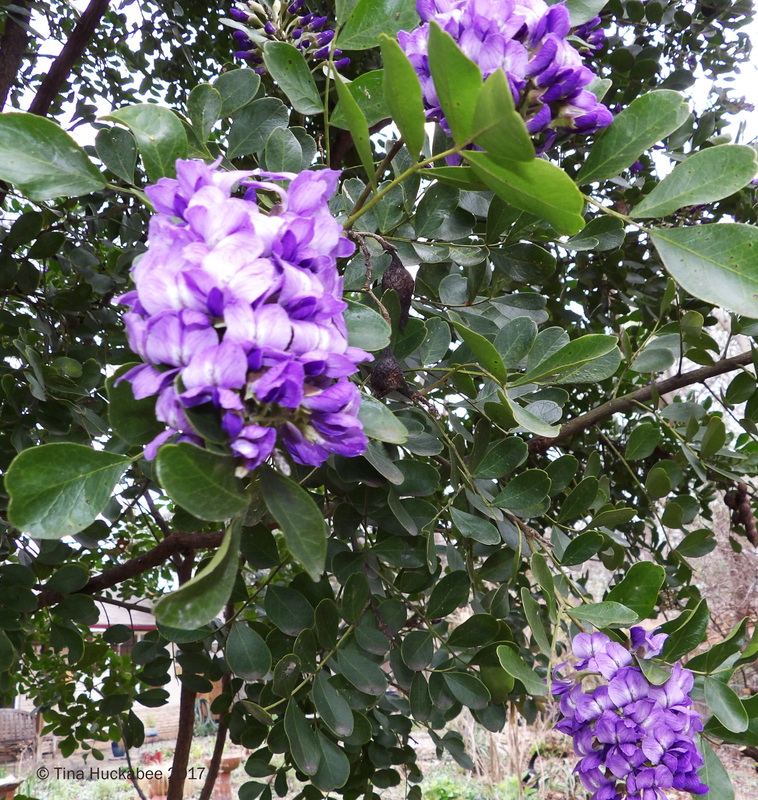 I love Texas Mountain Laurel! Needless to say, they do not do well over here in our wet climate, but I have tried to grow them. When I’m over in your part of the state, I stop to smell each and every one of them. You’d have a whole lotta sniffin’ if you came now! 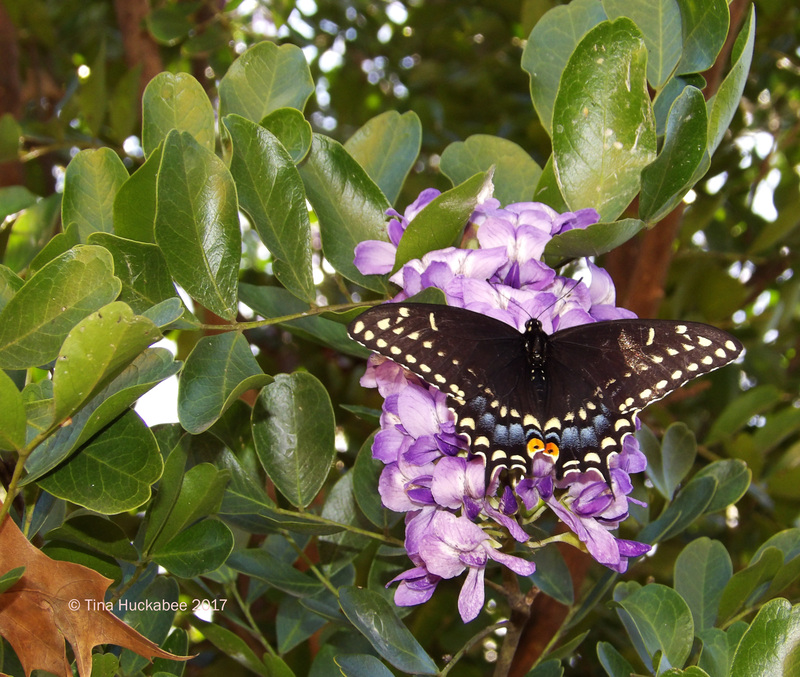 :) Mountain laurels really are gorgeous things, though, I’d agree. 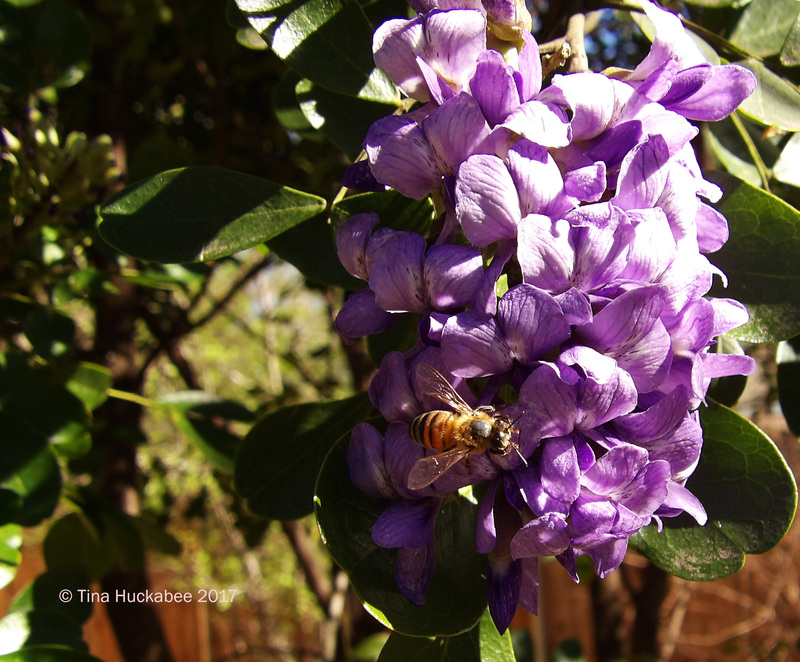 Tina the flowers of the mountain Laurel are spectacular. Their color is beautiful and they are very large! They are beautiful. Your bees will be delighted with so much food. Greetings from Margarita. The flowers are gorgeous, Margarita, I wish you could smell their fragrance. Yes, the bees are happy. 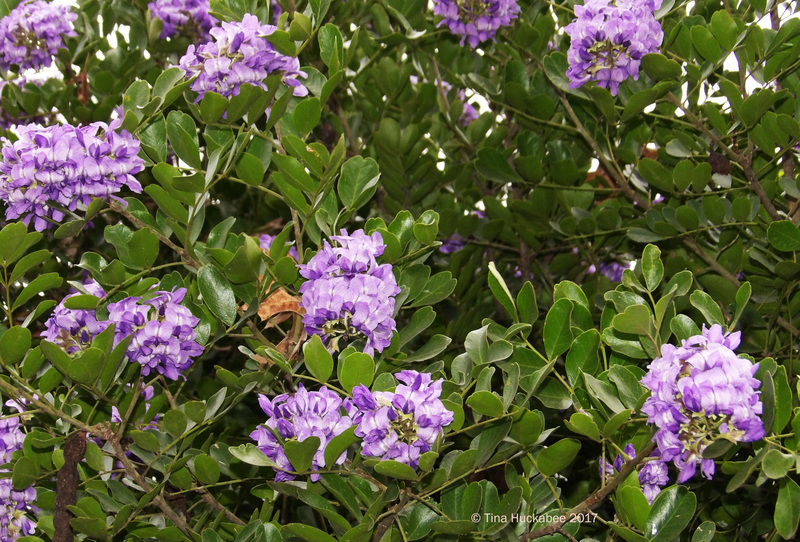 Beautiful shots of the mountain laurel. I grew mine from seed many years ago. I live 100 miles north of you. Mine was given to me by a doctors wife back in the seventies. Wish that I’d had the good sense to plant my own seeds. They take a long time to germinate unless scarified, much like the seed of bluebonnets. Mine is not yet blooming. Out nights have been cool but the days are warm-mostly. Thanks–it’s easy when you have a beautiful mode.l. 🙂 Mountain laurels are slow growing, that’s for sure. I have another one and for the first time, it bloomed! It’s probably 7-8 years old. They do take their time! 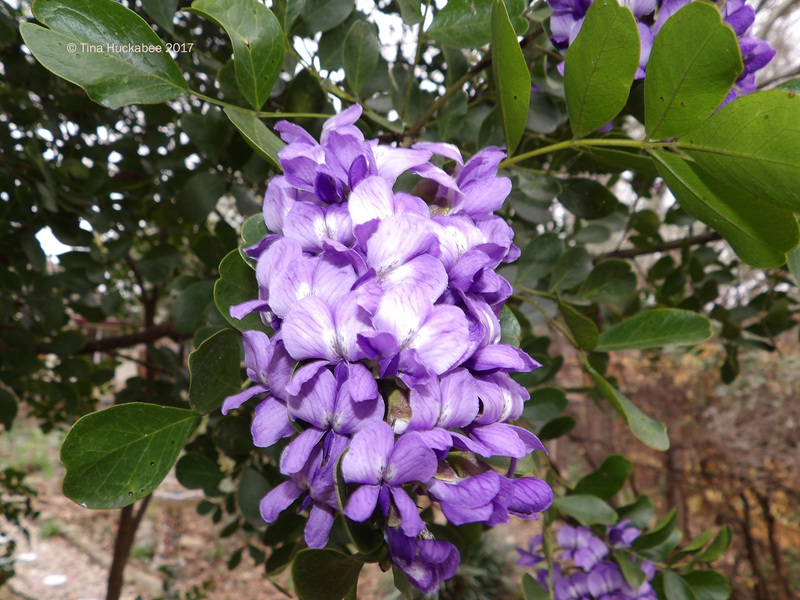 Mountain laurel is one of my favorites. A friend in the hill country has the biggest one I’ve ever seen, and your post is a heads-up. I’m going to call her tonight and check on it. I’ve missed its bloom the past two years, and I don’t intend to do that again~! Another big one I know lives right outside the Presidio at Goliad. I picked up two quarts of seeds from it one fall, but gave them away, since I don’t have my own little plot of Texas land. Your photos are just beautiful. We have to make do with wisteria down here — but there’s nothing wrong with that. It’s a stunning plant and not only in the spring. I do wish it would bloom just a little longer, it’s easy to miss the blooms. Funnily enough, I’ve often had trouble taking photos of the laurel; it seems that the light isn’t quite right or…I don’t know, something’s always amiss. I was generally pleased with this batch though–Thanks! And you’re right, there’s nothing in the world wrong with wisteria! I like the smell of grape soda. The flowers are the color of grape soda also. It’s quite a fragrance as the wind picks it up and delivers, or standing under/around the tree!